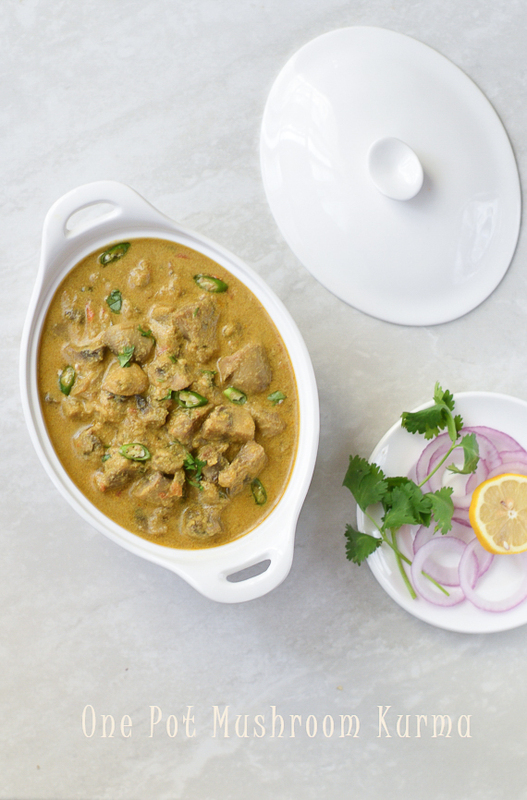 Ending the one pot dishes with a finger licking mushroom kurma.Kurma is a creamy,rich delicacy with a coconut base,served mostly for parottas in South India. Both vegetarian and non vegetarian kurma can be made in many methods and I have shared a bunch of kurma here. 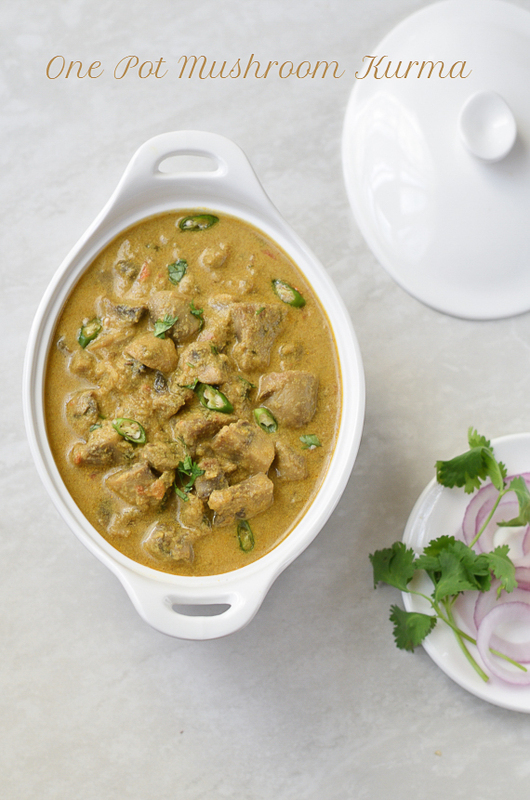 Pressure cooker method of making kurma is so easy and takes only 20 minutes.This kurma tastes great with both rice and roti. Grind the given ingredients to a smooth paste and keep it aside. Now in a pan heat the remaining oil and do the tempering with the given ingredients.Add the chopped onion,green chilly and curry leaves.Saute it with a pinch of salt till transparent.Add in the ginger&garlic paste,fry it until raw smell disappears.Add in chopped tomato. Cook the tomatoes until mushy.At this stage add in the mushrooms and give it a mix.Now add the spice powders and salt, mix it well. Let it cook for a minute or two.At this stage add in the ground paste and add around 1/2 cup of water. Add in the chopped coriander leaves,mint leaves and cover the pressure pan with the lid.Let it cook in a medium flame for 2 whistles.Put off the flame.Once the pressure subsides,remove the lid and let it cook for a boil.add in the lemon juice and some chopped coriander leaves.Put off the flame. Serve it with roti,parotta or rice. Grind the coconut to a very fine paste. The pictures are amazing Nalini. Yet another classic one pot dish. I enjoyed all your dishes!.. The color of the gravy looks lovely and the mushrooms are cooked just right. Look at the colour of the kurma, just prefect to please our eyes and tummy. Irresistible kurma Nalini, just need some rotis to clean that bowl. Hi nalini............love ur step by step kurma recipe.........very detailed....i love any type of kurma. urs looks delish! We hardly make kurmas , so definitely a dish to be bookmarked , the dish sounds very delicious , though I might add more veggies or perhaps substitute mushrooms with another veggie . The gravy looks delish. I am sure my older one will love this. This kurma with mushrooms look so good Nalini. Preparing it in pressure cooker makes it way too easier. That kurma looks very inviting and it is captured beautifully. I love kurma and I am drooling over the pictures. We don't eat mushrooms, but my boys live it now. So I am looking for recipes to start making with it. Bookmarking the recipe. 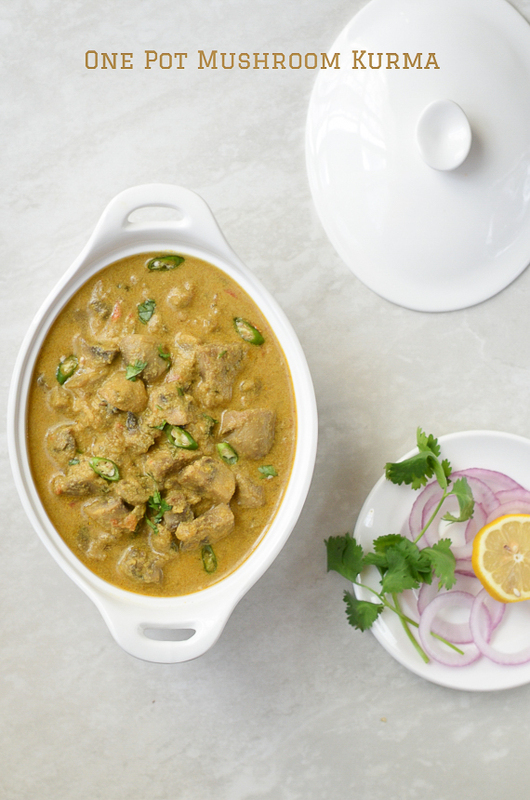 Mushroom Kurma sounds new to me and this looks tooo yummy with perfect consistency. What a wonderful way of cooking Mushrooms. Tempting Clicks. 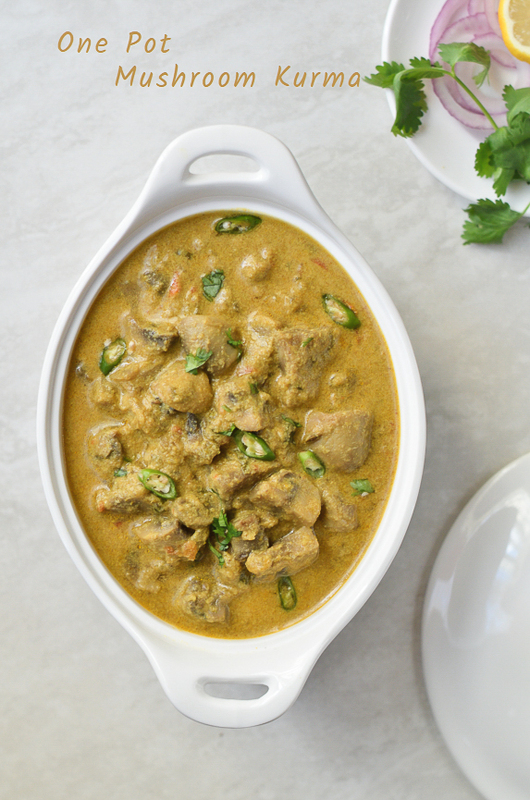 Hazzle free and easy kurma in a pressure cooker.. So beautifully presented! !